Feature Friday Film: Happy New Year Cats! I can’t believe that tomorrow is New Year’s Eve and that Sunday is the start of 2017. Time sure flies when you’re having fun. I’ve enjoyed hosting my own blog and helping Debbie write our books. I’ve met many wonderful cat characters and their authors, and my TBP (to-be-pawed) shelf of books is now overflowing. I am looking forward to more pawsome interviews and guests. If you’d like to participate, Debbie can add you to my calendar. Email her at debbiewriter@yahoo.com or me at my own pursonal email: sneakylibrarycat@gmail.com. Now for our feature film. Happy New Year’s and Purrs! Last but not least, there is a survey in Debbie’s author’s newsletter that is going out on New Year’s Day. This poll will help Debbie decide her next writing project for 2017. She is giving away a $5 Amazon gift card to a random person who completes the survey. You need to be a subscriber to participate, and I highly recommend that you subscribe because Debbie offers a monthly contest, book news, excerpts, and other fun features in the newsletter. To subscribe, visit her website and fill out the pop-up newsletter subscriber form. You then just need to confirm the email that is sent to you. If you have any problems subscribing, you can just email Debbie and she can manually subscribe you. The link to the newsletter is https://debbiedelouise.com. Debbie’s email is debbiewriter@yahoo.com. Now that I’ve got all that campaigning stuff out of the way, I can share my New Year’s news. Debbie has completed the third Cobble Cove mystery that she is calling Written in Stone. I’m happy to report that I have some pawsome scenes in it, but I can’t reveal any of them yet because Debbie still has to edit and submit the manuscript to her publisher. I will keep you posted and hope to feature an excerpt for you soon. The editing process is complicated, and sometimes I want to pull my fur out as I watch Debbie struggle with it. But one thing I’ve learned from being an author’s character is that writers are stubborn and don’t give up easily. Lucky for us. I patiently await the next installment of my adventure and, along with you wonderful readers, give her all the support I can. Debbie and I thank you for all your votes, reviews, comments, and shares this year. 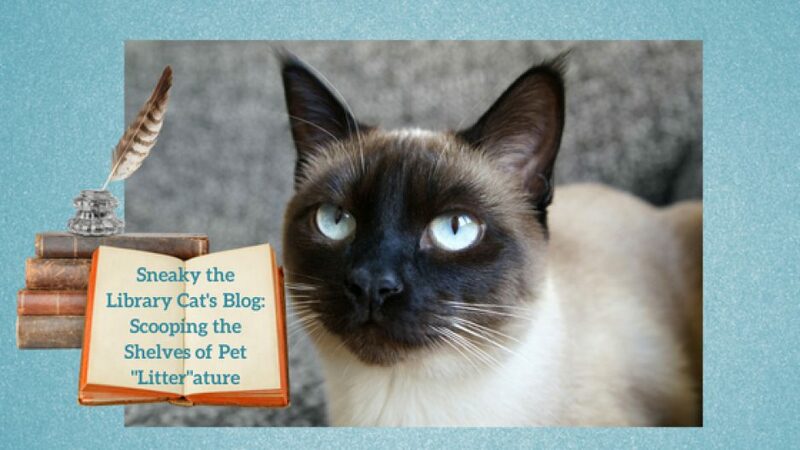 They make us purr and all the fur-strations that go with editing and promoting worthwhile. Have a purrfect New Year! Hi, folks. It’s Sneaky cat with your Feature Friday films. Today, I am happy to present two for you. The Yule Log wants me to take a long winter’s nap, but the Christmas Cats compilation is making me POL – Purr Out Loud. I hope you enjoy them. Merry Catmus and Happy Kittendays to you. Meow readers, it’s Sneaky here waiting for Santa Claws. Of course, my feline counterparts, Stripey and Oliver, will get all the real gifts. I know Debbie has bought catnip toys to fill their stockings, but she’s given me an even better gift. She’s written another Cobble Cove mystery. I’ve seen the first draft of it, and I think she’s beefed up my role a bit but there’s always room for improvement. At least she’s on the right track. Now all I have to do is get her and her publisher to put me on one of the covers. That would truly make me purr. I also heard the great news that our second book, Between a Rock and a Hard Place, was recently on the Amazon bestseller list for cozy mysteries. One thing you should be aware of is that Debbie is planning to reprint our first book, A Stone’s Throw. I’m sure this version with a new cover and some additions Debbie is considering will be even better than the first. However, this may take some time, hopefully not too many of my nine lives. In the meantime, although the book is currently not available for purchase, Debbie will continue to offer it as a giveaway. Today, December 22, is the last day you can vote for Debbie as Author of the Year. If I could vote, I would definitely paw this page and choose Debbie De Louise: http://solsticepublishing.com/vote-for-author-of-the-year/ You might also win some prizes just for casting your vote. Last but not least, I’m hoping to continue more cat character interviews next year. If your author writes cozy cat mysteries or any books featuring a cat character, please have them contact Debbie at debbiewriter@yahoo.com to arrange an interview for you. Debbie will even consider dog characters, and I will generously allow Fido to take over my blog and interview them. I sprang from my cat bed to see what was the matter. Tore apart the blinds, and ripped off the cord. I knew in a moment it must be Santa Claws. Happy Catmus to all, and to all good catnip. It’s been a pawsitively hectic week for me and Debbie, so I apologize for the late weekly film. I pawed this one out of the archives. It stars one of my favorite Internet cat, Grumpy, and is purrfect for holiday viewing. Before I share this pawsome movie with you, I’d also like to announce that the Cobble Cove Chat that began this month has been turned into a Facebook group. That means, that although a new character will host each month, readers can now post a question to any of the Cobble Cove characters. So if you have any questions for me, just join the group and ask away.